So I'm in Denver for work and my friend/coworker told me he'd take me to a foodie worthy place to eat. So we went to Tag, above is a picture of their logo. The menu looked really tasty and I was all in to go. The menu is small but that just means they have time to really focus on some good food. 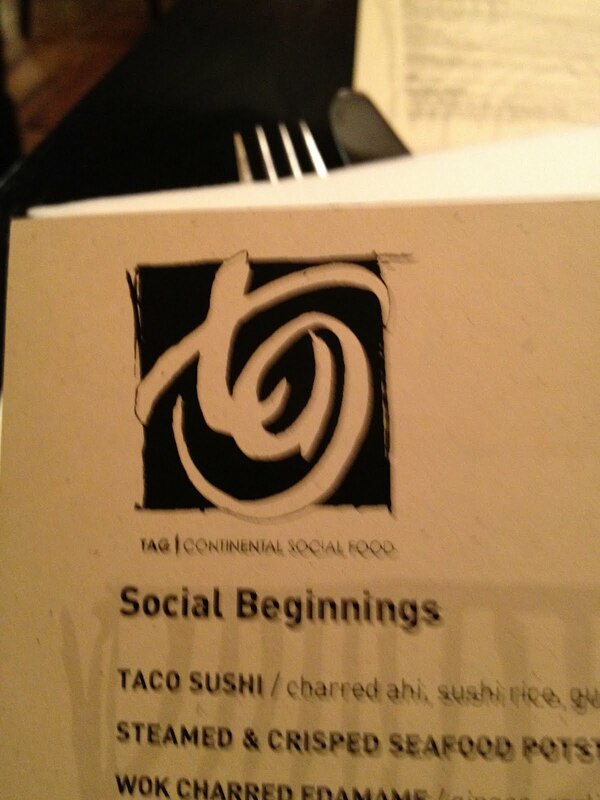 I don't know much about the restaurant but my friend mentioned it was in the top 10 of Denver. Who am I to argue? The restaurant is a cozy place with plenty of smaller nooks for couples to feel a sense of privacy and an more open area where tables are right up next to one another. To start we got the Kobe Beef Sliders with Gorgonzola Aioli and Shallot Confit this was served with "Duck Fat Fries". The fries had a sweet, salty with a bit of heat very delicious, the fries (after being fried) were tossed in a bit of duck fat. The sliders were very very tasty, great flavor. My friend mentioned it was a bit unfortunate to think about grinding up Kobe beef, but the results were very delightful. For my main I ordered the Colorado Lamb Loin. It came with a cipollini onion config wild mushrooms (oyster, chanterelle, and one more I can't remember) butternut squash and schezuan glaze (yeah that's how they spelled it). Ok I believe hands down this is the best preparation of lamb that I can recall. Holy Cow err Lamb. My friend ordered the Local Hanger Steak with truffle herb watercress salad, pueblo fingerling potatoes, gorgonazola and balsamic miso syrup. I'm not much of a starch eater but my friend was right, with the balsamic miso syrup this was very tasty. The steak itself was extremely well prepared and had a wonderful very rich meat flavor (the best description I could come up with) Beautiful presentation and absolutely delicious. I now understand why hanger steak was described as "the cut of meat butchers usually reserve for themselves rather than selling". Wow, hanger steak sous vide is coming up next. I skipped dessert but my friend got this Chocolate Dacquoise, basically a layered chocolate cake with a melt in your mouth caramel layer. My friend seemed to enjoy it and really enjoyed the raspberry sauce that went with it. Ok short and sweet, I just felt the need to capture this wonderful dinner. If you get to downtown Denver anytime it's a treasure trove of wonderful dining establishment, I wish I had a bit more time here to explore. It's a New Year and always hard to get back into the rhythm of things when you've had a whole month to derail yourself. 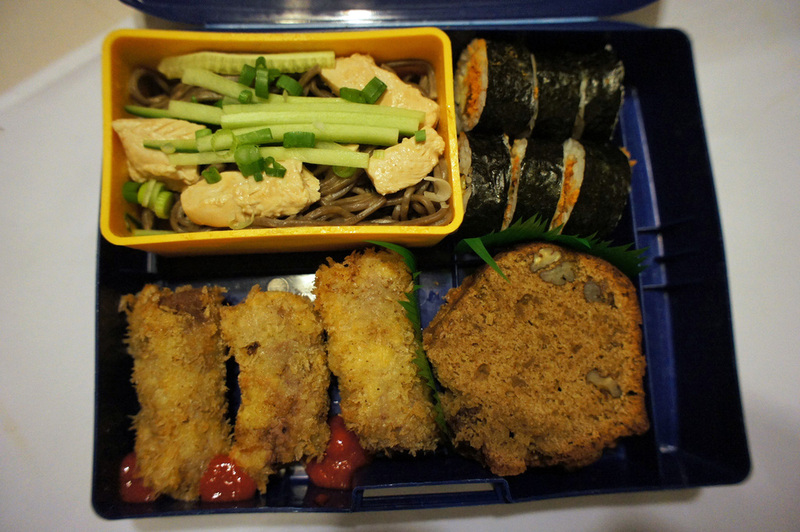 I managed to finally get a free weekend to put together a Bento but I haven't had much time to consider a theme. After four to five years it's getting more and more difficult to think of untried themes so I asked one of my eaters to come up with something for me. After careful consideration he comes back with "Meat", everything had to showcase meat. To be a little more fun, I added the stipulation that each course had to feature a different "meat". The difficulty was to tie the dishes together so that each course wasn't such a jarring experience so after a bit of research I went with "quasi" japanese. We start in Beef land with this Fried Negimaki stuffed with King Oyster Mushrooms. I have to give credit to JustBento for the idea although I underestimated the effort of making 30 of these things. I went with the King Oyster Mushroom because it's got a really solid texture that I could still cut into large strips to fit inside the beef and seasoned it with a bit of salt and pepper. I'm still on the fence about fried foods in the bentos, they re-heat poorly, most folks ignore my advice to use a toaster oven and the microwave would the turn the fried parts into mush. I'll have to see how my bento-ers did this time around. I added a bit of Sriracha to add a bit more flavor. I think for next time, I'll make it a true Negimaki and glaze the inside of the roll with Teriyaki sauce (I'll spare the outside as it would interfere with the crust). On to chicken. Nothing Earth shattering with this Chicken with Soba Noodles in Spicy Peanut Sauce. Again, this dish tends to have bento issues because when it chills the sauce locks up and it turns into a giant pile of noodles all glued together. A gentle reheat in the microwave fixes the problem. The chicken was quickly poached in some salted water. The peanut sauce consisted of peanut butter, sesame oil, soy sauce, and a bit of chili oil I had on hand for some spice. I ended up using only half of the stated amount of sauce, it would have been way too overwhelming otherwise. Rather than a bento this is definitely a quick lunch party dish. Prep up night before then boil the noodles and put it all together. Very tasty dish and I can see it being a light crowd pleaser. I had some dried salmon "sung" on hand, I had been meaning to try it out as I usually buy the "Pork Sung". This seemed like a great time to make use of the unusual ingredient. I featured the pork sung version of this roll in my second bento. This is the same roll just using the salmon instead (plus egg and chinese pickle). Honestly I can't say that there was a whole lot of taste and texture difference. Still yummy. Sorry about the picture, I need to get a new lighting rig, my NEX-3 doesn't do as well under fluorescent lights. You can always tell when I've lost my daylight while cooking. Photoshop does a reasonable job but you can still tell which ones are in natural light. You can tell when I have a bento that runs long when I have mixed lighting like this. Actually what I should say is "if it's all uniform natural lighting you know I was able to put together a quick lunch". Finally the big challenge! I think the intent behind selecting "Meat" as the theme was to challenge me to use meat in a dessert. I could have side stepped this because I don't always put in a dessert but what fun would that be. I scoured the web looking for something interesting. Lots of interesting meat desserts lots involving bacon. Since "putting bacon in anything" seems to be pretty popular I filtered those out of the pile. I then filtered out anything that had too many steps or too intricate and we end up with "Sausage Cake". Apparently this is an old native Native American recipe. This doesn't pre-date colonial times since it was the Spanish that introduced the pig to the new world so I'm not exactly sure when it was developed or if another animal was used as a substitute. Ground pork is used as part of the batter, you first beat it together with the sugar until well incorporated. I will admit to some hesitation as I put this into the oven. (I was disturbed enough to tweet about it) As it turns out this wasn't a really bad cake. I think a good dark coffee would have gone quite well with a slice. It's like a fruitcake (I omitted the fruit), dense and sweet (but not syrupy). Someone said it reminded them of a dense banana nut bread. I'll probably stay away from making it again, but I think this will rate with the most interesting dish I've baked. 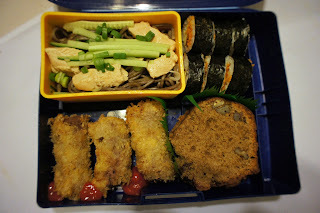 I have to say that this was probably not one of my best bentos. I'm still waiting to hear back from my bento diners. It certainly took me a lot of time to produce, I *barely* fit inside of budget, and the reheat challenges I talked about. All meat really made for a heavy box. I should have opted to somehow include more greens in the menu. Anyways lesson learned, better to come up with my own themes or face some weird oddball request. I'm going to have to pick something easier this next time around.